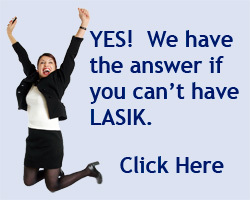 Vision correction is an excellent investment in an individual's well being. Because of this, we believe financial considerations should not be an obstacle to obtaining this procedure. Being sensitive to the fact that different patients have different needs, we provide the following payment options: All major credit cards, debit cards, checks, cash, and financing. North America's leading patient payment program. CareCredit offers a full range of payment plans to meet every financing need. With the popular (No Interest Payment Plans) * there are no interest charges if the balance is paid in full within the specified time period. Or, if you prefer an even lower monthly payment, more time to pay, you can choose the low interest ,(Extended Payment Plans) * Plus, there are no up front costs, no annual fees, and no pre-payment penalties. It's easy to apply and you'll receive an online decision in seconds.